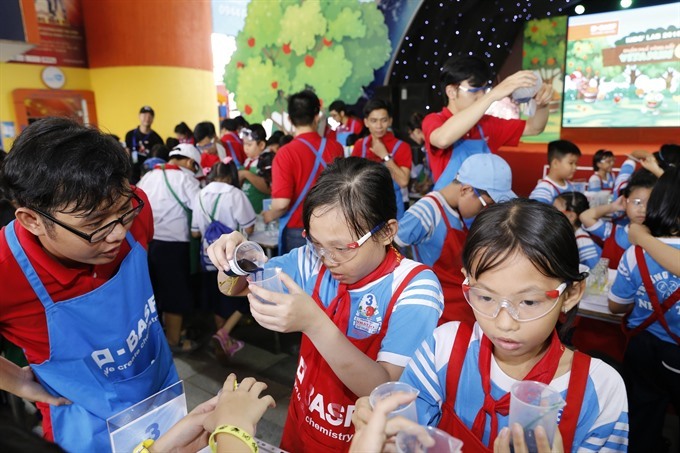 HCM CITY— Nearly 600 schoolchildren in HCM City participated yesterday in the BASF Kids’ Lab, an interactive educational programme for kids aged six to 12 to discover the world of chemistry through simple and safe hands-on experiments. They conducted two fun experiments to understand how vitamin C helps improve human health under the guidance of employees of BASF, a German chemical company. They measured and compared the vitamin C content and other nutrients in a number of fruits and vegetables. The experiment allowed them to get an understanding of the benefits of having colourful vegetables and fruits in their diet. They also made use of everyday materials like red cabbage, lemon and baking soda, and applied simple science theories to turn a piece of white paper into a vivid, decorated butterfly. Participants included children from Nhật Tảo and Trương Công Định primary schools in District 6, Bình Hưng and Cầu Xáng primary schools in Bình Chánh District and An Lạc 3 and Bình Trị 2 primary schools in Bình Tân District. Children from the Lucky House Social Welfare Centre in Bình Tân District were also invited. Begun in Germany in 1997 to nurture kids’ interest in chemistry, the programme has since been taken to more than 30 countries, including China, the UK, the US, Australia, Singapore, India, and Japan.